I got this recipe a few years ago from a former co-worker. I had almost forgotten about it until I was unpacking (Yes, I still have a few things to unpack from our move in March/April) and ran across it. I decided to go ahead and make it since I had all the ingredients on hand. 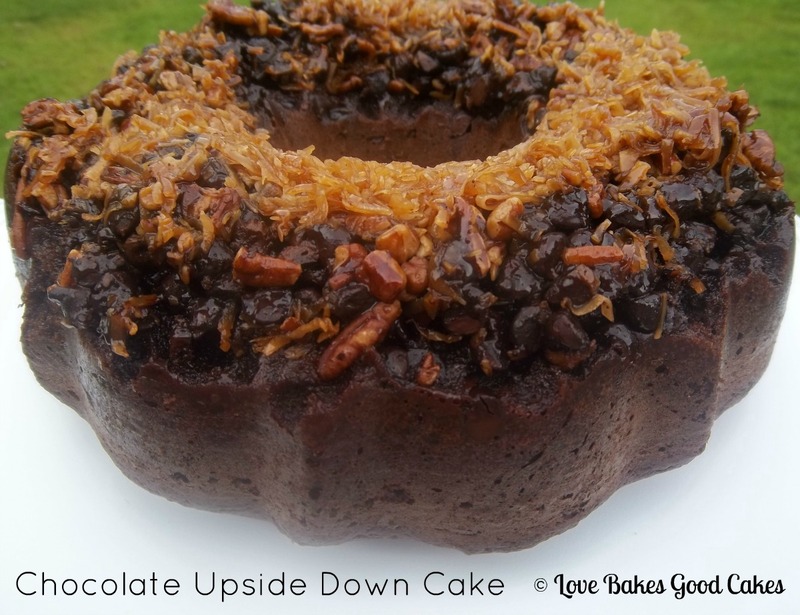 It’s a different take on the traditional German Chocolate Cake. Preheat oven to 350° F. Grease a Bundt pan and set aside. In a small saucepan, heat water and butter until butter is melted. Stir in brown sugar and mix well. Pour into Bundt pan. Sprinkle with coconut, chocolate, pecans and marshmallows. Prepare cake batter according to package directions. Carefully pour over the marshmallows. Bake according to the directions on the box for a Bundt cake or until a toothpick inserted near the center tests clean. Cool 5-10 minutes before inverting onto a serving platter. Hey, this looks awesome, Jamie! Pinning now. Love this! looks so rich and delicious! Your cakes looks so beautiful and absolutely delicious I just want to whip one up every time I read your posts. I'd be a few pounds heavier, but who cares, it's all looks so yummy! Came over from Seven Alive. I really, really should not have seen this recipe. I love German chocolate cake and especially, as Grace above put it, the goo! Sounds soo good! Thanks for linking up at Weekend Potluck. What an Awesome idea – It looks so good! My hubby's favorite cake. Great new twist! Thanks for joining the party at One Creative Weekend! I hope you have a great weekend. This is a beautiful cake! I love German Chocolate cake and this is a must try 🙂 Thanks so much for sharing at Creative Thursday this week. Have a wonderful weekend. Classic chocolate cake but I love all the little extras on the topping. Thanks for sharing it on foodie friday. Thanks so much for sharing at Heavenly Treats Sunday! YUMMY! I'm sure this one is great. I love German Chocolate cake, never had one that called for marshmallows though. I'm pinning this for later use. Thanks! This sounds delicious. Love me some German Chocolate cake and this sounds like the ultimate. THANKS FOR SHARING the recipe. It's a must try. Now following you from PICKINandPAINTIN.blogspot.com. Please come visit me. That looks amazing! Easy too! Thanks so much for sharing at Mom On Timeout! This is a lovely cake! This would be good to have on my chocolate craving days. Thanks for sharing on Marvelous Mondays! Jamie my 2 favorite cakes are german chocolate cake and pineapple up-side-down cake! Now I can combine the idea of both. Thanks for sharing, looking forward to trying it for a congregation picnic! not sure what I did wrong but my cake was a HUGE FLOP…..when I turned it over it was a wet sloppy mess and the cake cracked in several places!!!! Advise please, it tasted great, looked awful. Hmmmm ….. I've never had that problem and I'm so sorry you did :/ First, I would make sure the pan is greased very well …. Second, I would make sure the chocolate chips and marshmallows had a few minutes to "set up" before flipping it over. Maybe try 10-15 minutes before flipping? I hope this helps you!